Richard Allen was born on February 14, 1860. His parents were slaves. Richard was a slave, too. The family worked for a lawyer. His name was Benjamin Chew. Mr. Chew lived in Philadelphia. The Allen’s cleaned his house and cooked his food. They took care of his children. When Richard was 7 years old, Mr. Chew needed money. He sold the Allen family to a farmer. The farmer was named Mr. Stokley. He lived in Delaware. Ten years later, Mr. Stokley sold Richard’s mother and some of her children. Richard never saw them again. Sometimes preachers would visit the Stokley farm. The slaves were allowed to listen to them. When Richard was 17, he heard a Methodist preacher speak. Richard liked what he heard. He became a Methodist. He helped to lead the prayers. Richard worked hard for Farmer Stokley. He wanted to show that being a Christian made him a better person. Farmer Stokley sometimes listened to the preachers, too. One preacher convinced Farmer Stokley that it was wrong to keep slaves. But Mr. Stokley could not afford to let his slaves go free. He said that if the slaves could earn the money, he would let them buy their freedom. Richard worked hard for a long time. When he was 20 years old, he bought his freedom. Now Richard was free. He needed to earn a living. He did all kinds of jobs. He cut wood. He worked in a brickyard. He drove a wagon that delivered salt. When he had some money, Richard stopped working and preached. When he ran out of money, he found another job. In 1786 Richard was invited to come to Philadelphia. A church there wanted him to preach. The church was called St. George’s Methodist Episcopal Church. Richard preached each Sunday at 5 a.m. Many people liked his preaching. Many African Americans came to the church. This upset some white people. They made the African Americans feel unwelcome. Richard asked to start his own church. It would be for African Americans. They could worship together. They would not bother anyone. The Methodist church said no. They wanted him to stay at St. George’s. Some of the black church members were very poor. They needed help. Richard and some friends started a group to help them. It was called the Free African Society. This group paid dues. The money was used to help widows and people with no jobs. Richard still needed to earn a living. He cleaned chimneys. He saved his money. Then he opened a shoemaker’s shop. His shop did well. At St. George’s church, African Americans could not sit where they liked. They had to sit in one balcony. One day Richard and two friends were late for church. When they went inside, there were no seats in the balcony. They sat somewhere else. They started to pray. An usher told them to leave. He would not let them finish praying. This was too much. The men left. All the African American members left with them. They never returned. The people who had left St. George’s wanted to worship God. They wanted a church. The Free African Society became a kind of church. People met for worship. They had their own form of worship. Some parts were like a Quaker meeting. They made their own wedding service. Some people liked Quaker ways. They wanted to stop being Methodists. Richard did not. He still liked the Methodist message. The Episcopal bishop was very friendly to the Free African Society. He invited them to join his Church. They agreed. Richard would not leave his Methodist ways. He left the Free African Society. He was their friend, but he did not belong to the group any more. The Free African Society wanted to build a church. They asked Richard to find them some land. Richard found a good spot. It was at the corner of 6th and Lombard Street. He signed a contract for the land. The Free African Society found another spot that they liked better. They bought this other piece of land. They left Richard with the other contract. Richard had made a promise. He had promised to buy the land at 6th and Lombard. He would keep his promise. He worked very hard. He paid the money that was owed. The Free African Society built their church. When it was finished, it was named the African Episcopal Church of St. Thomas. Richard’s friend Absalom Jones was the pastor. Richard wished them well. Some other people felt the same way Richard did. They liked the Methodist way. Richard decided to make a place for them to worship. He found a blacksmith’s shop. He bought it. He had it moved to his land on Lombard Street. He used this building as his church. In 1793 a terrible sickness came to Philadelphia. It was called yellow fever. Many people became sick. Many died. By the end of September, 100 people were dying each day. Some people moved away. The poor people had to stay. Mayor Matthew Clarkson knew that things were bad. There were not enough people to take care of the sick. Dead bodies were not being taken away. Someone needed to do this work. Mayor Clarkson asked Richard and Absalom Jones to organize work parties. They could take care of the sick. They could haul away the dead bodies. The African American community helped out. They did this dangerous work. Some became sick. Some died. No one asked to be paid. Before the epidemic ended, over 5000 people died. When it was safe, the people who had left Philadelphia came back. Mayor Clarkson made a speech. He praised the African American community for their work. Dr. Benjamin Rush also thanked them for what they had done. Now the Methodist church became friendly. They supported Richard’s new church. The new church was named Bethel. 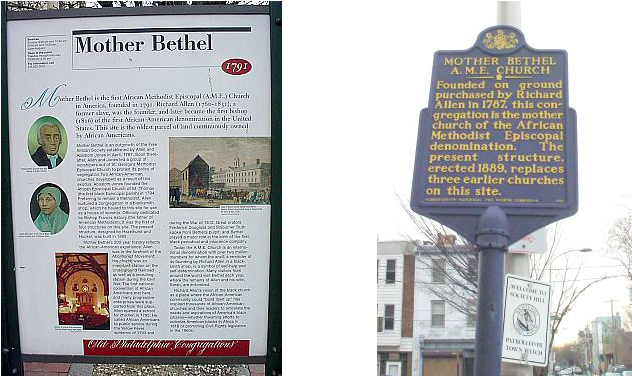 The first service in Bethel was held on July 29, 1794. For a while, things went well. But some of the leaders at St. George’s still wanted control. They said that Bethel must do as they said. The people of Bethel did not like this. They wanted to rule themselves. There were other African American churches in other towns. There was one in Baltimore. Richard contacted these churches. He asked them to come to a meeting. He wanted to form a new church. The group met in April 1816. They agreed to organize a church for African Americans. It would follow Methodist teaching. It would have its own bishops. They named their new church. They called it the African Methodist Episcopal Church. They chose Richard as their first bishop. Richard was 56 years old. Richard was married by now. His first wife, Flora, died in 1801. His second wife’s name was Sarah. She had been a slave too. Richard and Sarah were married in 1801. They had six children. Richard wanted slavery to stop. He worked hard to convince white people that slavery was wrong. He wrote pamphlets to explain his views. When runaway slaves came through Philadelphia, Richard and Sarah hid them. They helped them to go on their way. Once a man tried to take Richard from his house. He wanted to sell Richard as a slave. He asked the police for help. They all knew Richard. They knew he was a free man. They let Richard go. Richard formed some new societies. The people who joined them promised not to buy goods made with slave labor. Richard had two strong friends. One was Absalom Jones. The other was James Forten. Mr. Forten was a businessman. He had a sail making business. These three men became leaders in the black community. In 1812 England attacked the United States. People feared that they would attack Philadelphia. The city asked Richard, Absalom, and James for help. They asked them to organize a black regiment. 2500 African American men agreed to help. They were called the Black Legion. They stood on guard for two days. Then the danger was past. Many free African Americans fought against slavery. Slave owners did not like this. They formed a group called the African Colonization Society. Their goal was to send free blacks back to Africa. Richard and his friends did not like this idea. They were American citizens. They should be treated like citizens. If they were moved to Africa, who would be left to help the slaves to freedom? Richard fought against this society. He held meetings, wrote articles, and made speeches. About 2000 free African Americans did return to Africa. Richard died on March 26, 1831. He was 71 years old. These signs are posted outside Mother Bethel Church. In Philadelphia, Sixth Street near the Mother Bethel AME Zion church is also named Richard Allen Way. The Richard Allen Schools are in Philadelphia. Allen University, named for Richard Allen, was founded in 1870 in Columbia, South Carolina. Mother Bethel AME Church is at 6th and Lombard. There is a Richard Allen Museum there.